Chocolate. There are a few people out there who don’t like it or care for it…and that’s……well, that’s…fine. I’m just not one of them. I was the little girl who would sneak an enormous chocolate chip cookie in her mouth right before dinner, hoping her parents wouldn’t see (oh and they did…I wasn’t very good at being sneaky). I just love chocolate. It’s so classic, so smooth, and such a special treat to humanity! 2) Sean and I joined a gym. More than anything, making the conscious decision as a “newlie” married couple to maintain our health together meant the world to me. It was SO fun to hop around the gym from one machine to the next with my handsome cutie-pie of a husband smiling back at me. He even taught me a thing or two about boxing. Apparently I have a pretty rockin right hook. Is that what it’s called? A right hook? I don’t remember. Whatever, it was really fun. I’m no rockstar, but you might not want to deprive me of chocolate any time soon. Hehe…kidding. 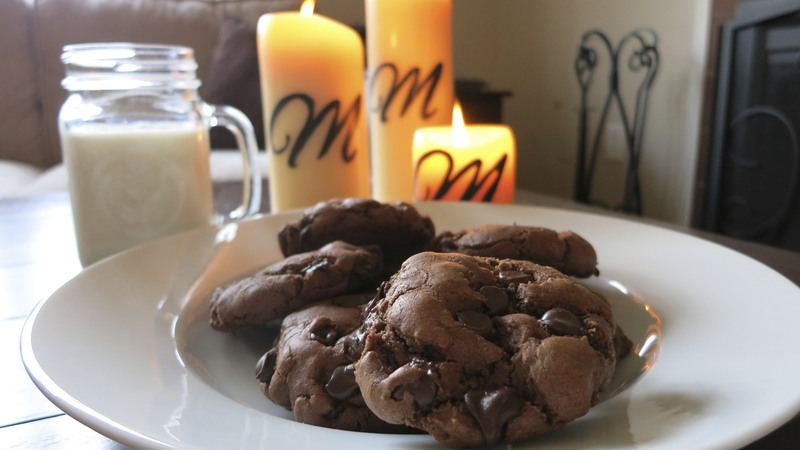 One more thing about how fun being back in the gym was, and then I’ll get to describing the double chocolate cookie recipe. When I was on the eliptical machine I had set it for 20 minutes, but thanks to the little TV attached, I ended up pushing it to 35 minutes because the movie “Charlie’s Angels” was on. LOVE that movie. I wanted to keep watching, and as Lucy Lu, Cameron Diaz, and Drew Barrymore were taking care of business I kept cranking up the speed as if I was an “Angel” myself. Before I knew it, I burned a ton of calories and still felt fantastic. Pretty effective, those TV’s! Beat the eggs, sugar, vanilla extract, and butter (pre-softened) so that it gets all fluffy. 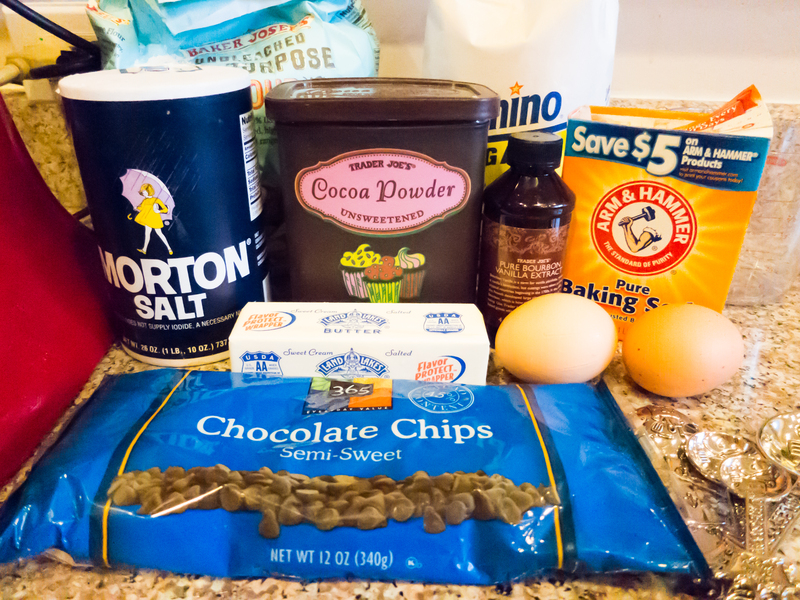 Then add in the cocoa, flour, salt, and baking soda. 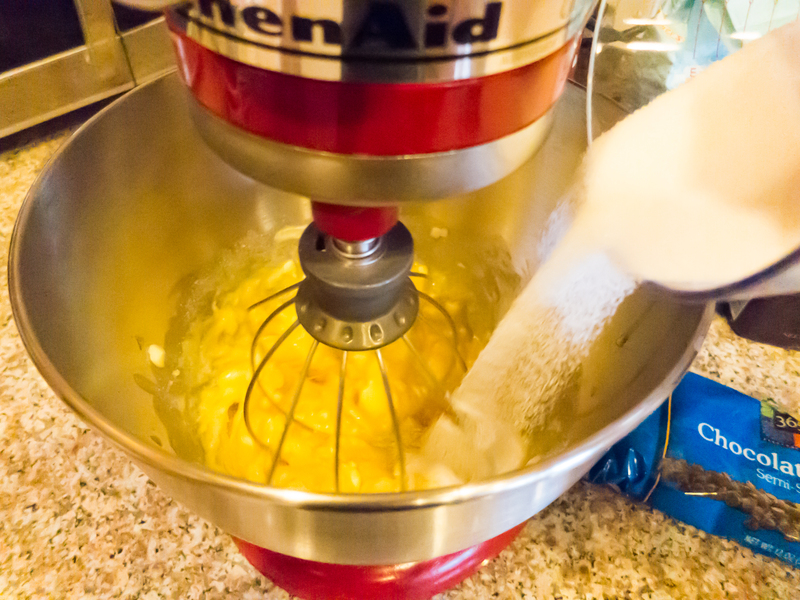 It’ll start to get pretty thick and tough, so I usually switch the kitchen aid whisk with a more durable utensil so that it doesn’t get stuck and un-stirred in the center. 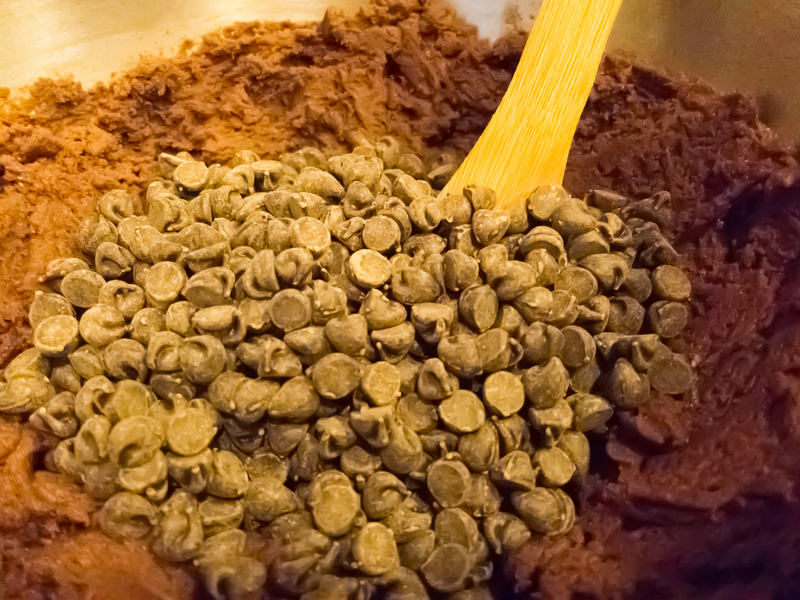 Then…add…more chocolate. Again, a bag is (was) too much, so just use about 3/4 of the bag or even maybe half the bag. Isn’t it beautiful already?!?! Once it’s all mixed together, and the pre-heated oven has reached 350 degrees, ball up the dough so that you’ll have close to 2 dozen cookies (I use two un-greased cookie sheets). 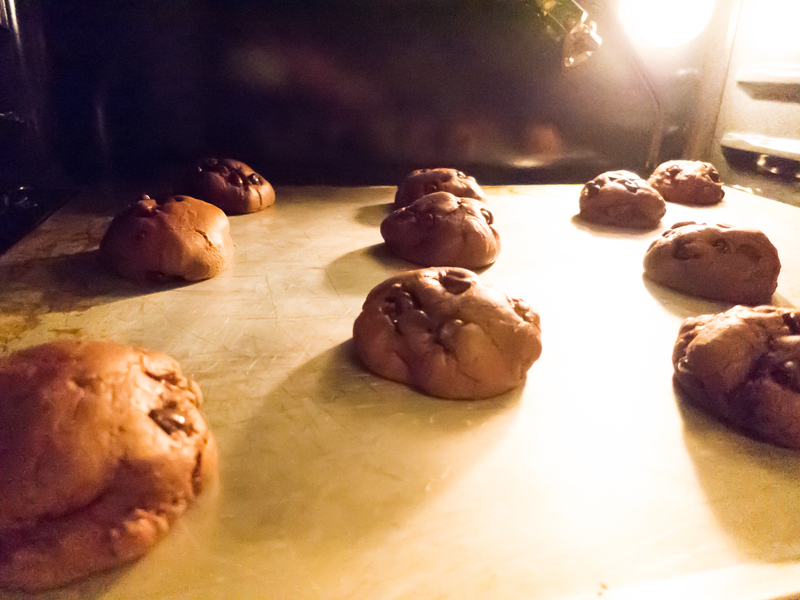 Keep an eye on them as they’ll cook pretty fast, but it depends on how large you make the cookies. The first time I cooked them, they were ready in 10 minutes. This 2nd time needed a good 15 minutes. And then……when you have them out, cooled, and ready for devouring – get the glass of milk ready. It’s for sure a heavenly combination.